Some people can flat out write. Kathy Berken is one of those people. You might be the kind of reader who shies away from stories about the mentally challenged, adults with Down’s syndrome, the cognitively disabled, because Berken’s book is a memoir of her time serving God’s children who fit those categories. If you do you’ll be missing a truly remarkable piece of literature. 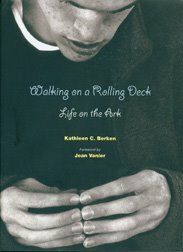 “Walking on a Rolling Deck” has drama, empathy, irony, humor and insight into the human character of every one of us. Developed from her journal during nine years at The Arch, the L’Arche (rhymes with “marsh”) community in Clinton, Iowa, Berken’s short book — published by Liturgical Press in Collegeville, Minn. (http://www.litpress.org/) — opens her life to us, and in doing so touches ours. And, Lord, can she write. She describes her years there as both growth-filled and as scary. There’s wiping butts and brushing teeth, and heart-warming, sacred moments. A spiritual person, she seeks God in all she does, and sometimes she finds him. If Kathy Berken is anything, she’s honest. She writes not about a sugar-coated experience but about real life with real people. Berken writes conversationally, like your best friend telling you all about her day but in brief, well-edited chapters that are never more than a few pages. You’ll love the poignant story about being served Christmas breakfast by one of the people whom she served everyday. You wonder how she ever stayed nine years – and how she survived, to be frank – when she learned first that she had breast cancer and later when a core member (that’s what L’Arche calls the mentally challenged) turns violent. Read “Walking on a Rolling Deck” to find out.